Information about middle school volleyball skills sessions and tryouts. Open gym is an opportunity for both non-experienced and experienced players to come out to perform some independent programming and get more familiar with the sport, while coaches monitor their training. Student athletes will have an opportunity to showcase their volleyball skills, athleticism, coachability and eagerness to learn the sports. 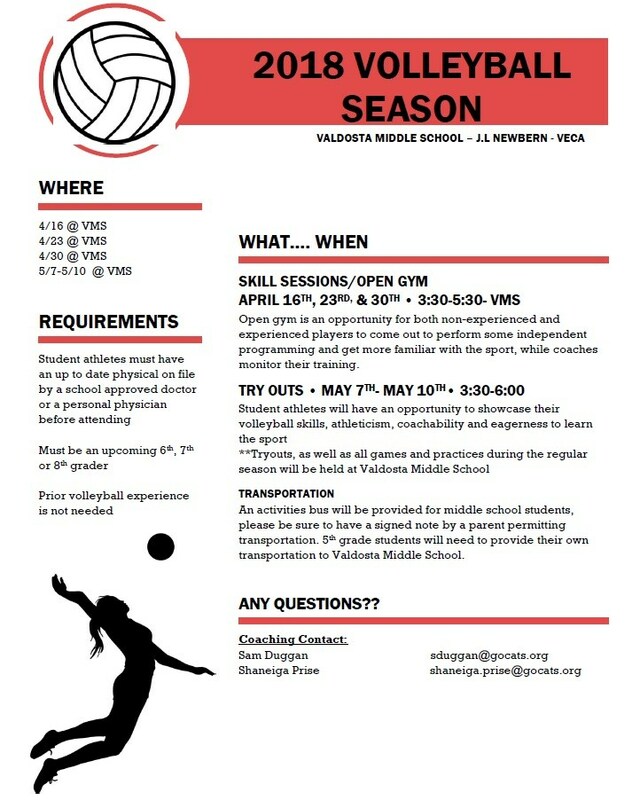 Tryouts, as well as all games and practices during the regular season will be held at VMS. Student athletes must have an up to date physical on file by a school approved doctor or personal physician before attending. Must be an upcoming 6th, 7th, or 8th graders. Prior volleyball experience is not needed. An activities bus will be provided for middle school students, please be sure to have a signed note by a parent permitting transportation. 5th grade students will need to provide their own transportation to VMS.